Bodies, both mice and human, have a natural anti-cancer defense. Cells which have accumulated so many mutations that might lead to uncontrolled growth (i.e., cancer) move into senescent mode; they cease dividing and are eventually eliminated by the immune system. Below are links to three media articles on the work, together with a link to the research article abstract. Three recent studies have demonstrated that breathing polluted air has significant negative effects, including a shorter lifespan, greater risk of dementia, and diminished cognitive capacity. Airborne PM(Particulate Matter)2.5 is material less than 2.5 micrometers, which can be seen only with electron microscopes. Being so small, they can travel deeply into our lungs with quite harmful effects. They are produced from car & truck exhausts, industrial plants include coal-fired powerplants, and also include dust produced by windstorms. Averaged across the globe, breathing them typically cuts up to a year off lifespans, and in areas of greater pollution, up to two years. This study involved a sample of 130,978 adults living in London between 2005 and 2013. The participants were between 50 and 79 years old. Broadly, even after making adjustments for factors such as smoking and social status/class, those from the most polluted areas of London were much more at risk of dementia (40% more) than those from the least polluted areas. Living with air pollution very likely reduces your intelligence, as measured by test scores for arithmetic and language. The effect can, on average, be as if one had lost a year of eduction. For people over 64, for men, and for those with lower education, the effect can be even greater. An international research team carried out the research in China using 20,000 people, between 2010 and 2014. People who were exposed longer to polluted air had greater damage to their intelligence. Language ability was hurt more than mathematical ability, and men were harmed more than women. The better one manages each of these, the lower one’s risk of dementia. No definitive smoking gun on alcohol use has yet been presented, but the evidence leans heavily against it. Two very large direct studies and one huge meta study have recently appeared, and they largely point to increased risk of dementia as well as of cardiometabolic disease (includes stroke, coronary heart disease, and diabetes). Contribution of alcohol use disorders to the burden of dementia in France 2008–13: a nationwide retrospective cohort study. All links have been added to Epidemiology . Is It Possible Alzheimer’s Is An Infectious Disease? Infectious Theory Of Alzheimer’s Disease Draws Fresh Interest. ….neurosurgeons die from Alzheimer’s at a seven-fold higher rate than they do from other disorders. ….people whose spouses have dementia are at a six-times greater risk for the condition themselves. We’ve added links to two broad extensive guides about sleep: for aging in general, and for dementia in particular. Although appearing on a bedding manufacturer’s site, these are well-done, and the level of advertising is restrained. The Lancet International Commission on Dementia Prevention and Care. 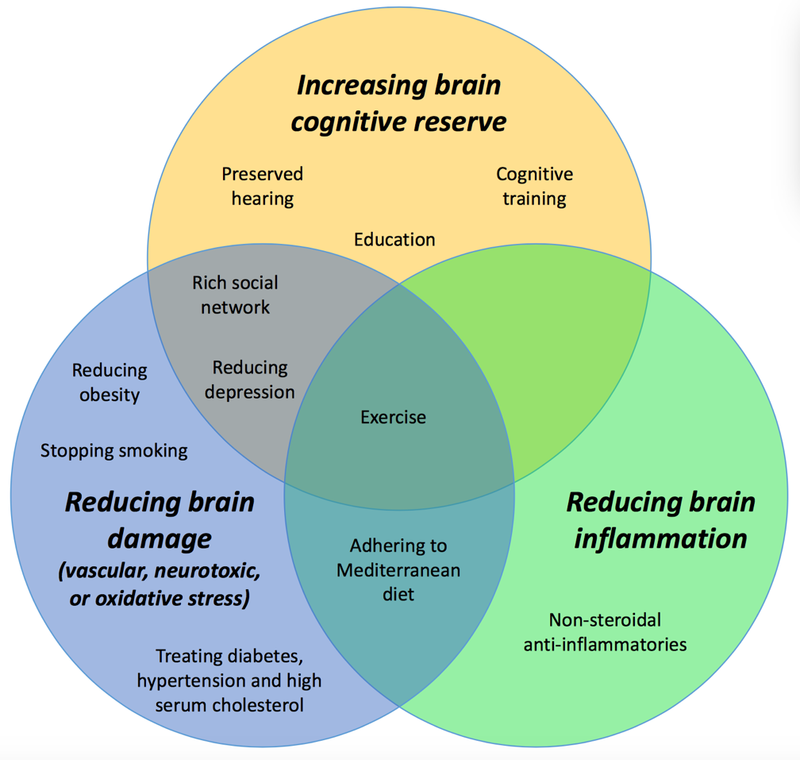 Exercise, Manage Blood Pressure, Engage in Brain Training. These solidly overlap with the Lancet recommendations. (See 3 Good Things To Do For Your Brain: Exercise, Manage Blood Pressure, Brain Training). All links have been added to Alzheimer’s > Amelioration/Prevention. Earlier this month, we described a study demonstrating a link between the presence of certain herpes viruses in the brain, and the presence of Alzheimer’s signs. Interestingly, three more studies of this connection have appeared. All three confirm this connection, but the third in addition suggests that aggressive treatment with herpes anti-viral medication can significantly reduce the chance of encountering dementia. However, the study did not attempt to deal with people who had already encountered dementia. Anti-herpetic Medications and Reduced Risk of Dementia in Patients with Herpes Simplex Virus Infections-a Nationwide, Population-Based Cohort Study in Taiwan. High blood pressure is known to lead to heart attack/failure, stroke, and kidney disease or failure, among other bad consequences. Now, a recently reported study shows that high blood pressure appears to be linked to higher risk of (silent)infarcts (brain lesions/dead brain tissue) and a higher number of Alzheimer’s tangles (but not plaques — yet), and overall, a higher risk of Alzheimer’s. The study group consisted of nearly 1,300 individuals — 2/3 of whom had high blood pressure — followed for an average of 8 years before their deaths, after which their brains were autopsied to determine the effects of the high blood pressure. Yet another reason to attempt to manage hypertension.